The concerts, tagged “Reaching Out,” will be at 3 p.m. and 6 p.m. on Saturday, Feb. 23 at Shepherd of the Valley Lutheran Church, 17625 NW Cornell Rd. in Beaverton. The suggested donation for each concert is $20, to be paid onsite. Reservations, however, are required to secure a seat and may be made at http://music.uoregon.edu/gospel. In recent years, the UO Gospel Singers have been grabbing both hearts and headlines. 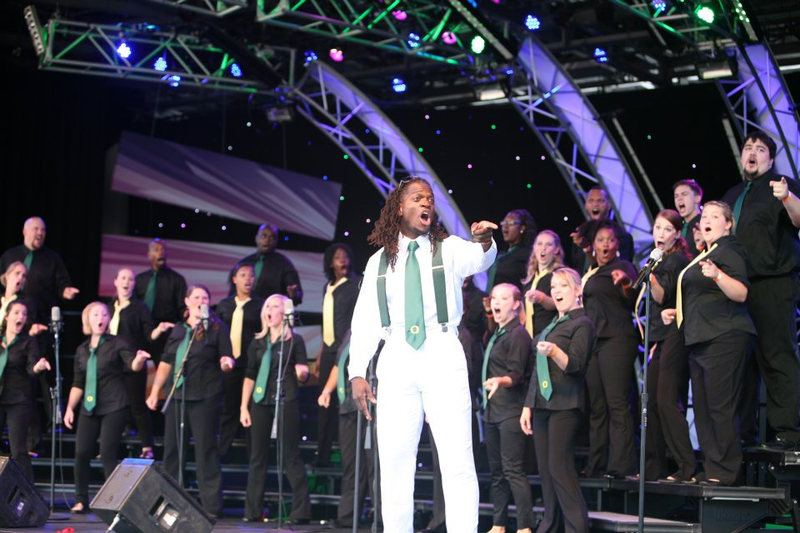 The ensemble won the national Disney Gospel Choir Fest in 2010 and 2011, the first two years of that competition. Andiel Brown, director of the UO Gospel Singers, says many of the students in the UO’s gospel ensembles are from China originally, which has made the cultural exchange possible. “Student and alumni connections are paving the way for us; now all we need are the dollars to get there,” he says. In China, the Gospel Singers will perform at two Chinese universities, a performance hall, and at the Great Wall of China. The ensemble hopes to raise $25,000 at the Feb. 23 concerts, which will help cover the costs of airfare, visas, and bilingual tour guides. Friends and fans of the UO Gospel Singers can make monetary gifts in support of the trip at isupport.uoregon.edu, or in person at the Feb. 23 concerts.